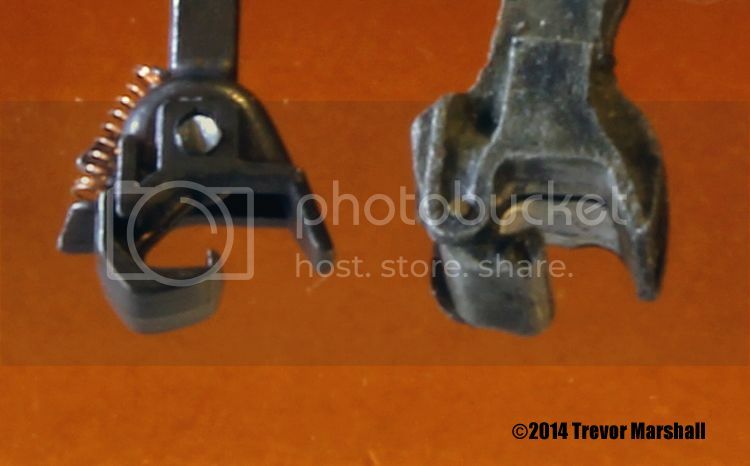 As the photos show, the couplers are very close in size. The EC64 is obviously more prototypical in appearance – that is, after all, one of the selling points of the Sergent line. But if we assume the Sergent EC64 is scale sized, then it’s clear the Kadee #5 is much closer to S scale than is the Kadee 808. I have also compared the coupler boxes for an HO Kadee #5 (Kadee #232) to the couplers boxes for an S scale Kadee #808. While I did not take pictures, I know that the boxes have differences which prevent 808s from being put into a Kadee 5 box, and vice versa. I will have to confirm this by mounting a #232 box to an S scale car. But in theory, I should be able to use Kadee #232 boxes (and the couplers in the 5, 20 and 40 ranges) on S scale equipment without having to modify my existing mounting procedures. That should save a whole lot of time and aggravation should I decide to change over the fleet to the Kadee #5. Stay tuned for more on this in future posts. This entry was posted in Couplers, equipment, tech notes by Trevor. Bookmark the permalink. How different are the #5 and #808? When you put them on an operating layout, will the difference be significant enough to matter overall? I found in HO that when I switched from Sergent to Accu-Mate Proto, I really didn’t really notice the difference. Even though the Sergent is smaller and much more prototypical, the differences get lost in the bigger picture of an operating railroad. I wonder if the same might be true of the #5 and #808. I used the 808s before I started experimenting with the Sergent couplers. They’re definitely larger – have a look at the caboose photos in the previous post on this topic. The size issue really does show up in photographs – and i take a lot of photos of the layout. It is one reason I wanted to try the Sergents. Interesting timing of the post. I purchased some HO Sergent couplers to give them a try. I love how they look, but it was a real “bear” to construct them for me. Eyesight is getting poor and I am not as steady as I was a few years ago. I got better at putting them together with some parctice and mounted a few pair. I found, however, that they were preffy finicky and finally decided to bag the idea. Nothing against Sergent as I think for younger fellows it may be a great thing, but the KDs are much easier. I have been looking at Accumate as a replacement for the KDs eventually, as I have heard some good things about them and like the close coupling of the HO rolling stock. 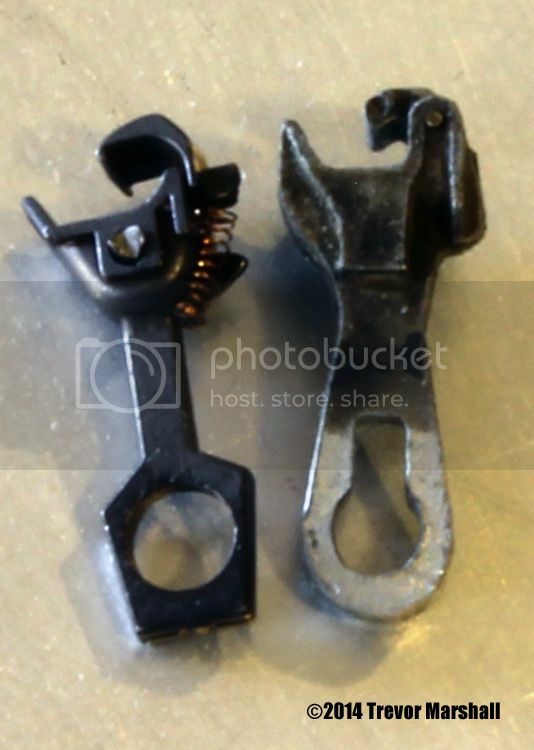 How do the HO “scale couplers” ie #58 compare to the Sergents? About the same as they compare to Kadee 5 couplers – so too small for S.
I should add that I’m not breaking new ground with the Kadee 5 – others in S have been using it for years. It’s just a new direction for me. Those Walthers ProtoMAX couplers might fix some of the height problem with the Kadee #5. Try the original Accumate they are beefier than the KD #5. Available in bulk on their website. They have been recommended for On30. I’m quite happy with my Kadee experience. But others may wantnto know this, so thanks! http://www.pacificcoastairlinerr.com/accumates/ is a link to discussion of using the Accumate originals for On30 or On3. Here is the Accurail website for the couplers http://www.accurail.com/accurail/parts.htm #1075 is the bulk pack. Thanks, Bill. I got my info from the same place (Pacific Coast) …. I’ll have to give them an order.